Some habits are beneficial, and some are not. This is true in life and especially when it comes to students’ schooling habits. 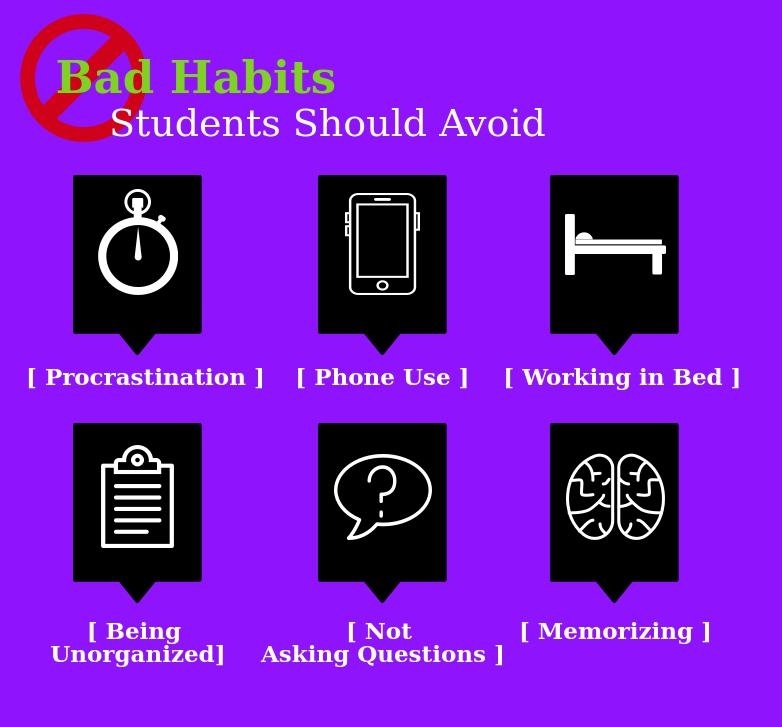 We are going to identify 6 bad habits students should avoid and give you tips on what to do instead! When students return home from school, starting straight away on their homework is usually not their first thought, but putting off homework leads to low motivation and cramming. Putting off assignments until the night before they are due is also a problem. Less time to work means less quality work, and more stress. Create a set time to work on homework! For example, once your student gets home, let him or her relax, recharge, and have a snack for about an hour. Then, he or she must begin doing homework. This creates a routine and prevents putting off work. We live in a technological world, which isn’t a bad thing, but when the technology starts impeding on a student’s focus, then negative side effects ensue. Snapchat, Instagram, and texting back friends are tempting but need to wait until after school work is completed. Students can give their phones to their parents/guardian until their work is completed. If the student is older and more disciplined, he or she can put the phone in a different room or turn it off. Putting the phone on silent is a simple but powerful tool, as well. The less temptation for the student, the better. Laying in bed to do homework is a tempting idea, but the comfort can be distracting. Students minds need to be awake and alert to perform the best and laying in bed tricks the mind into thinking it is time to rest. This isn’t optimal for working! Create a space where the student will be sitting or standing. Putting together a desk area at home away from distracting environments complete with school supplies is an idea! If there isn’t a space at home, libraries are quiet environments where students can focus. Most libraries have Student Help Centers if homework help is needed- an extra perk! If a student does not know what homework needs completed, then nothing will be completed! Being organized is a very important habit to have in every aspect of life. Students won’t be as stressed if they are organized too. Use a planner! Have your student write down the assignments and when they are due. Using different colored pens and pencils can be a fun perk and add to the visual organization. Tip: Being organized can help solve procrastinating, too. Having set times to work keeps students organized and avoids procrastinating on schoolwork. Asking questions shows students are thinking about the information and being active learners. If a student doesn’t understand a concept in class, it is important to ask the teacher to prevent falling behind. Make it known to students that if they have a question, they should raise their hand and ask immediately. Emphasize that asking questions is not a bad thing, but an action that will help them learn better. If the student would feel more comfortable talking to the teacher one-on-one instead of in front of the class, suggest writing down the questions and asking them after the lesson. When students have many things to finish for homework, especially in older grades, it is tempting and easier to memorize parts of lessons, like vocabulary, instead of understanding what things really mean. This is an especially bad habit because the information memorized won’t stick with the student. If a student truly understands, he or she can apply the information in different situations, demonstrating a deep understanding of the subject, but memorizing, on the other hand, is just surface level. By being organized and allotting enough time to sufficiently complete homework and study, the need to simply memorize information can be avoided. When studying, make information meaningful, relate it to already known knowledge, and try to formulate questions about the information. Doing simple things like this creates more connections to the information and therefore creates understanding. Bad school habits are not easy things to break, but knowing alternatives to bad habits helps the process! Try applying some of these good habits with students and see the benefits they reap. What habit(s) does your student have that are beneficial or that may need to be broken?